All parts of your selling process can be handle in CRM. Using a CRM to sell your products or services, means you only have one place to support your selling efforts. You can manage all communication with leads, prospects or opportunities within your current customers base, in one place. As you’ll see from the Sales Force Automation feature you’ll be able streamline this process and have it running on rails so you can convert more in to customers than ever before. Tall Emu CRM allows you to make sales and quotations to your clients, either as simple or complex quotations or as part of a sales pipeline where multiple related quotes could be present. It’s possible to use the existing product & item list imported from the accounting system, or create new products of your own – or even just use completely generic “opportunity” records with simple text descriptions of the sales opportunity. Our powerful customisation, product and stock capabilities mean however you sell, Tall Emu CRM can support your business. 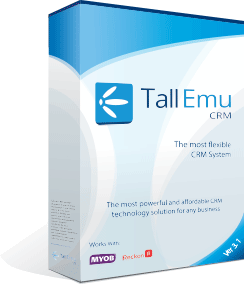 The best way to fully appreciate the power of Tall Emu CRM is to have a demo. Click here to Request one.